But to some, the word is offensive for a number of reasons. 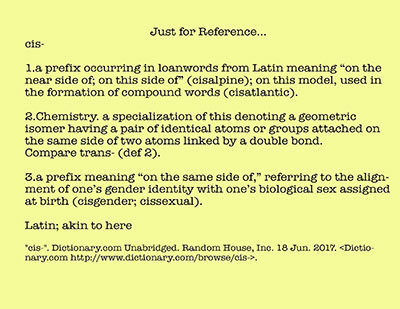 One of which is the general dislike for labels, another is being tagged with a word that a person does not wish to be identified as, and yet another is a new complaint, that the word “cis” too closely resembles the word “sissy” in how it sounds. Those citing that last complaint say the word triggers memories of ugly confrontations and bullying in their youth. The original Facebook post has been shared hundreds of times and the thread of comments runs longer than a paperback novel. There are people on both sides, some with views you might not expect: cisgender supporters of the word, and transgender opponents. But what’s important is not the debate, but the word itself. First, here’s our Bil Browning with some easy to understand graphics from a 2013 post to explain. 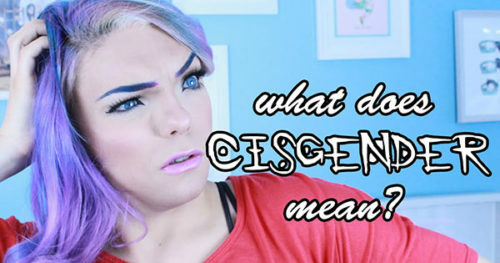 Whenever the word “cisgender” is used to describe a non-transgender person, there’s always someone who gins up outrage and claims that it is a derogatory word that’s only meant as an insult. It’s not, of course, but that’s never stopped a good case of the vapors. This tongue-in-cheek infographic really puts the whole thing in perspective. Here’s a video from YouTuber Stef Sanjati that might help explain things further. There’s been a debate raging that no one here at Bilerico has been willing to touch with a 10-foot pole: Is it OK to call non-transgender people “cisgender”? Well, the debate is mostly a small group of gay and lesbian cis-people who don’t particularly like the word, and everyone else who either likes it or is OK with it in certain situations. I don’t know who gets to speak for the hundreds of millions of English-speaking cis people out there, but since most people don’t even know the word exists, it’s worth having this debate now.